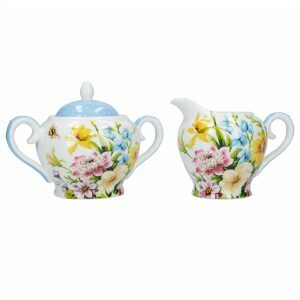 Katie Alice is a self-taught designer whose whimsical designs, very much led by a love for vintage florals have become household staples. Not formerly a designer by trade, Katie grew with each collection learning as she went along and has now launched over 10 new ranges of tableware, with the very first collection continuing to perform very well. 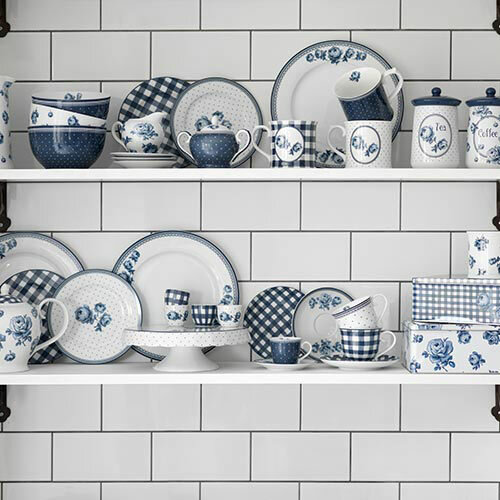 Vintage Indigo, which has been one of the most successful new launches to date, has topped the best seller list for Creative Tops’ dinnerware collections and has been listed in Waitrose. Now living in the beautiful town of Stamford, Katie has taken on a new home restoration project as well as launching her own website and blog. She has been invited several times to demonstrate in Japan’s top department stores for their prestigious British Fairs and has been recognized in top publications such as Good Housekeeping, Period Living, Ideal Home and Country Living – whose renowned fairs she regularly exhibits at. Along with Waitrose, Katie Alice has also sold well in Debenhams, Fenwick’s, Sainsbury’s and Waterstones, as well as many independent shops around England. There is also a big international following, with the Katie Alice brand being Creative Tops’ most successful export. Is it true you never went to university? If you had to live anywhere in the world, where would it be? Tricky... but I think Florence, with all the art and the pasta and the win and the wild boar. I once accidentally navigated a hired Fiat Panda right through the centre square of Florence on a sunny Saturday afternoon, which at the time was a living nightmare but in hindsight I now feel an incredible connection with the place. If you were a tv programme what would your theme tune be? 'My baby just cares for me' by Nina Simone, easily. That piano wins. Do you prefer cooking dinner or eating it? Do you get really disappointed when you order a Caesar salad and the anchovy is all mixed up in the dressing without any whole bits, even though you know that’s really how it's supposed to be? Is it true you learnt a Michael Jackson dance routine to perform at your best friend’s wedding? Yes, with my sister. We looked 50% cool and 50% like total idiots. It worked perfectly. What's the best cocktail you've ever had? A fresh strawberry daiquiri in a chocolate powder coated cocktail glass from Club Feather Bower in Hong Kong. I'm not exaggerating when i say it was a total life changing experience. Are you a little bit prone to exaggerating? What's the closest near death experience you've ever had? That would be the time I went to QVC for a screen test. Luckily they didn't want me back. What do you think are some of life's most un-important, important lessons? Cook pasta al dente, learn to enjoy tea without sugar, if you're feeling tired it's probably just best to have a nap and a little bit of dark chocolate goes a long way. Is it true you are addicted to buying really expensive magazines? Would you like to see Katie Alice on other products such as bedding or stationary? Oooh yes I would actually thanks for asking. I’d even say why stop there. How about stationery or even clothes? A cute little highland fling dress, can you imagine! If you spent as much time working as you did daydreaming would you be able to afford your loft extension? Yes, I think I probably would. And finally, who is Alice? She's me... Alice is my middle name. I never used to like it when I was little but now I love it, obvs!